I was watching a youtube video by Jen Evers (link: Watercolor Extravaganza | 1.5hrs length ) the other day and I ended up joining her facebook group Koala T Crafts for inspiration and fun. Anyway, in the video Jen was using brusho powders (which are basically identical to my Ken Oliver Color Burst powders) and it reminded me of this panel that I made earlier this month and turned into a birthday card for my lovely friend Virginia. I absolutely love how this panel came out. 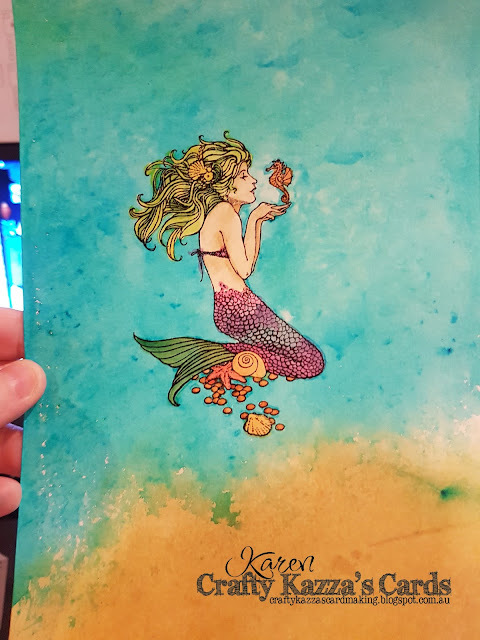 First up I stamped the "Stampendous Cling Stamp - Mermaid" on the A4 sheet and then painted over her with Pebeo Drawing Gum (otherwise known as liquid masking fluid). Next it was time to go crazy with my powder water colours. I used ultramarine blue powder and water on watercolour paper but left the bottom section blank. It looked so much like water under my mermaid that it led me to think it looked a little like a beach at the bottom, so I kept it blank and later sponged on a few different brown and yellow distress inks. Once it was dry (I think I got back to it the next day), I used a tip I saw on another video that proved to be awesome: Put a plastic bag (like a freezer bag) over your hand and rub the dried mask off with the bag on your finger. It worked awesomely and didn't tear any of the paper. To colour in my mermaid, I scribbled Tim Holtz distress markers on an acrylic stamp block and picked it up with my water brush. Going back and adding more colour once it was dried, i.e. layering up the colour, added to the natural shadows that you can see indicated on the stamped image. Finally I had a few little spots where the background and mermaid didn't quite meet, so I went over those with a copic marker (next time I'll pick a lighter tone, lol). My image turned out to be all sparkly too which was a fluke as I'm really sure where it came from (maybe the colour burst powder, I haven't checked). So here she is finally! 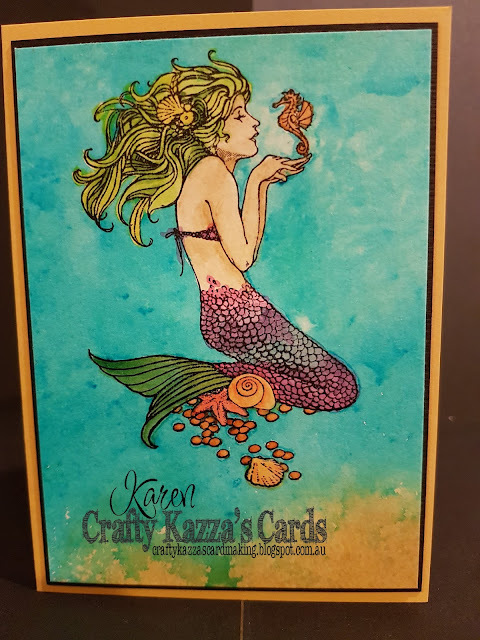 To make her into a card for my friend Virgina, I cut the panel down to fit on a yellowy card base from Stampin Up that actually matched the 'sand' perfectly and put a black mat underneath her to really emphasise the panel colours and make them pop. I also put some of the panel off cuts into the inside to tie it all together. Oh and by the way, Virginia absolutely LOVES the card I made for her birthday. Her hair is more green than yellow but didn't show up correctly in the photos. Thanks as always for stopping by and checking out what I've been up to. I hope you have a little crafty time for yourself really soon! Totally fabulous, Karen!! You have done a wonderful job, and your card looks amazing.